Battalion Chief Joseph Grzelak went straight from high school into the Marine Corps, spending 1968 and 1969 in Vietnam. He was discharged as a Sergeant in 1970 and appointed to FDNY in 1973. After that was a slow but steady climb up the FDNY ladder for this “firefighter’s chief”. 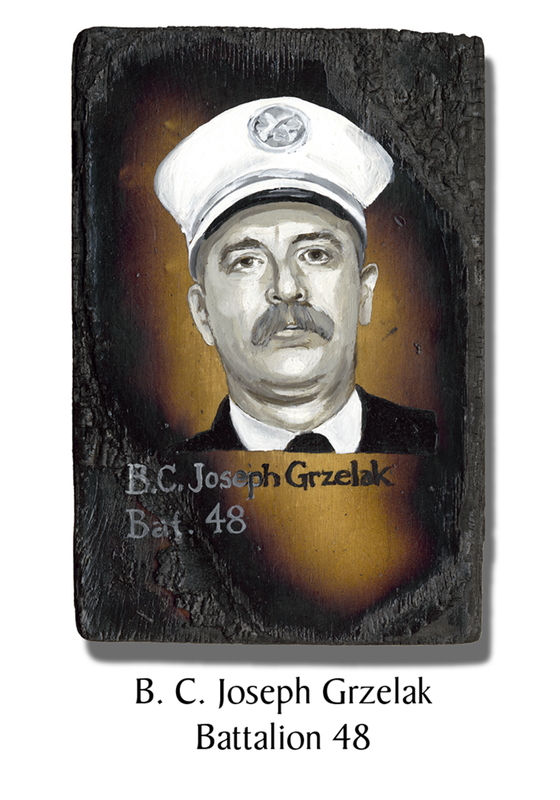 Grzelak was made Lieutenant in 87, Captain in ’93 and Battalion Chief in 1998. He was assigned to Battalion 48. Nicknamed “Joe Knows” for his encyclopedia knowledge about anything and everything, he was the go-to man if you had a question. On 9/11 he brought his binder filled with research on fighting high-rise fires. It was later found in his completely crushed car. B.C. Grzelak’s remains were recovered in March 2002, next to the last standing beam of Tower Two. This entry was posted in Better Angels Stories and tagged 343, 9/11, Battalion 48, better angels, Dawn Siebel, FDNY, firefighter, firefighters, firefighters of 9/11, Joseph Grzelak, LODD, Manhattan, memorial, NFFF, paintings, portraits, World Trade Center, WTC. Bookmark the permalink.